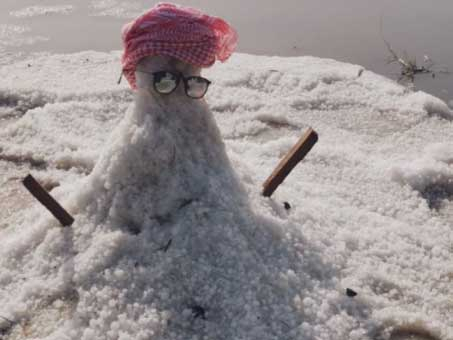 Dubai: Residents in the northern and eastern emirates woke up to roads paved in hail storms on Sunday morning, bringing Twitter to a frenzy. Videos and pictures of Saturday night’s rare weather phenomenon flooded social networking sites as Umm Al Quwain, Fujairah and Ras Al Khaimah witnessed heavy rains and a hailstorm, which left streets with sheets of thin ice floating across the cities. Dr Ahmad Habib, a meteorologist at the National Centre of Meterology (NCM), told Gulf News that the country has been witnessing unstable weather since Friday, which is expect to continue over the next few days. “There are clouds moving from the western and central areas of Saudi Arabia, which is approaching our area and developing further. On Saturday afternoon, the southern region of the UAE witnessed heavy rainfall since noon, and those clouds then shifted to the north and gradually moved to the east,” said Dr Habib. He explained that this kind of weather is attributed to low pressure in the south western area of the UAE’s surface layer, in addition to a trough extension of low pressure in the upper air. “Saturday witnessed more pressure than Sunday, which may lead to some rain in the northern parts of the country as well as in the east, like Umm Al Quwain”. Dr Habib confirmed that hailstorms are quite unusual for this month since, “March is the transition period between winter and summer”. The next thunderstorm is expected to happen on Tuesday night and into Wednesday morning, starting from the Western Region in Abu Dhabi, according to the NCM. The rainclouds are then most likely to move towards the east and hit Dubai, in addition to the northern emirates. “It will be cloudy in general with rainfall over scattered areas that may be associated with thunder at times, with a decrease in temperatures,” said the NCM. Strong winds of 25-35 km/h, reaching up to 55 km/h at times, will cause dust and sand to blow over exposed areas, resulting in reduced visibility on the roads. The NCM warned motorists to drive with caution, and to adhere to the traffic rules to avoid traffic accidents.